An update to work being done with Elduino CAN128. 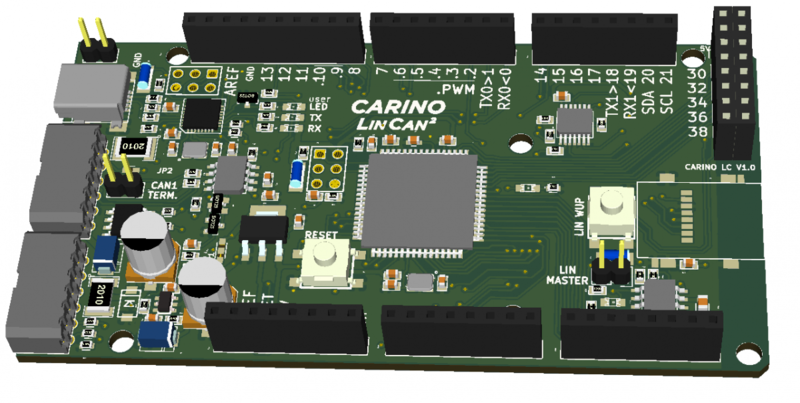 The board is changing the name to CARINO LC to better represent its use and functionality. Some improvements have been done in the design of the board. Terminal block connectors for power, CAN and I/O connections. This will allow disconnecting the board from the car without having to mark all the wires and screw/unscrew the individual wires. Bluetooth connectivity*. Having wireless connectivity it will be even easier to connect it to a smartphone/tablet or PC. Two high current (3A) digital outputs (low-side switches). This will allow to control high power devices or relays directly from the board. 12V compatible digital input. You will be able to sense the ignition key or other 12V signal without any additional hardware. Protection against reverse voltage connected to the VIN pin of the Arduino header. Fixed previous design mistakes - added some extra components, fixed footprints, etc. PCBs and parts for the board is already on the way!! !